I honestly wanted to like the Toyota Rush, I really did. 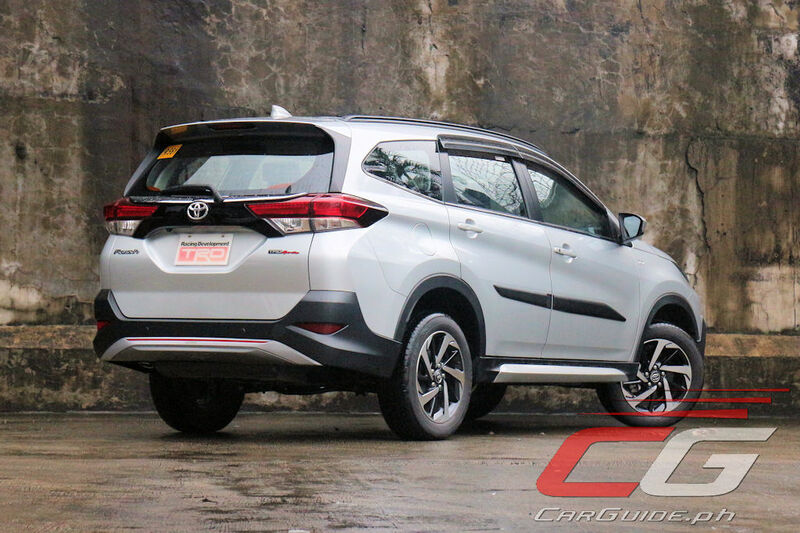 Given how late it entered the sub-compact SUV segment and given all the resources Toyota had in its disposal, it’s the one that’s supposed to turn the market upside down; it’s the one that’s supposed to make everyone quiver with fear. But it doesn’t; not even in the slightest. More than anything, it actually reminds you just how good everyone else’s is. Now, before we start jotting down stuff in the negative column, let’s start with things I did like (and mind you, the list isn’t that long): the looks. If there’s anything Toyota’s done right with the Rush, it’s the way they’ve nailed the design. Compared to its competitors which all look like they were done when the stylists were having a bad day, the Rush looks mighty fine. 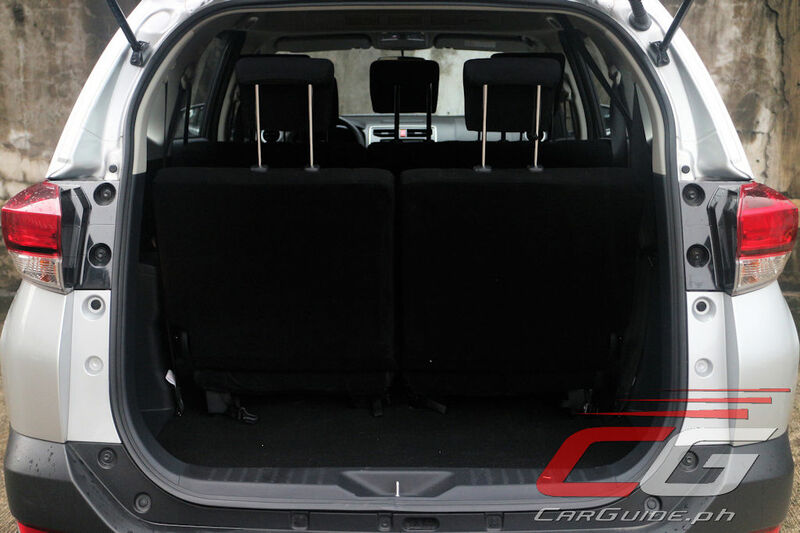 Despite the Avanza origins, the design doesn’t remotely resemble an MPV. 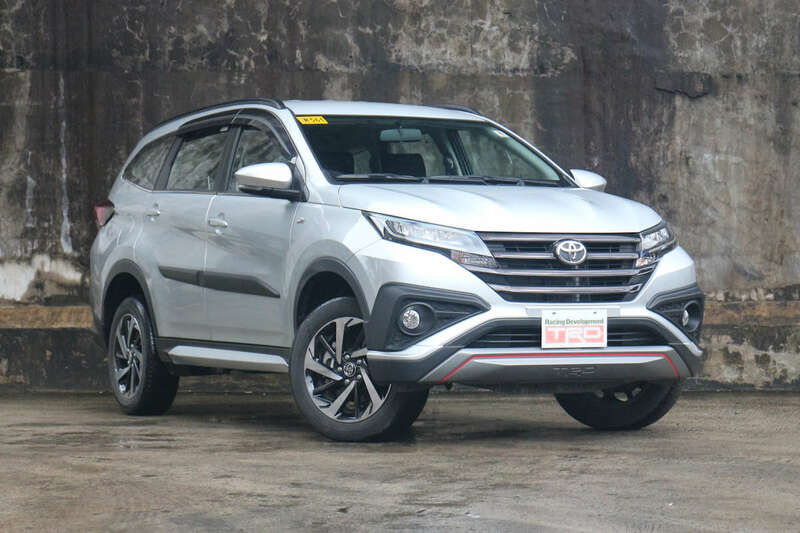 The flat-faced front, squinted headlights, angular styling—they manage to recall the Fortuner, which is, in my opinion, still one of the best-looking midsized SUVs around. The tall stance, coupled with the narrow body does make it look a bit lanky, but that’s forgivable. 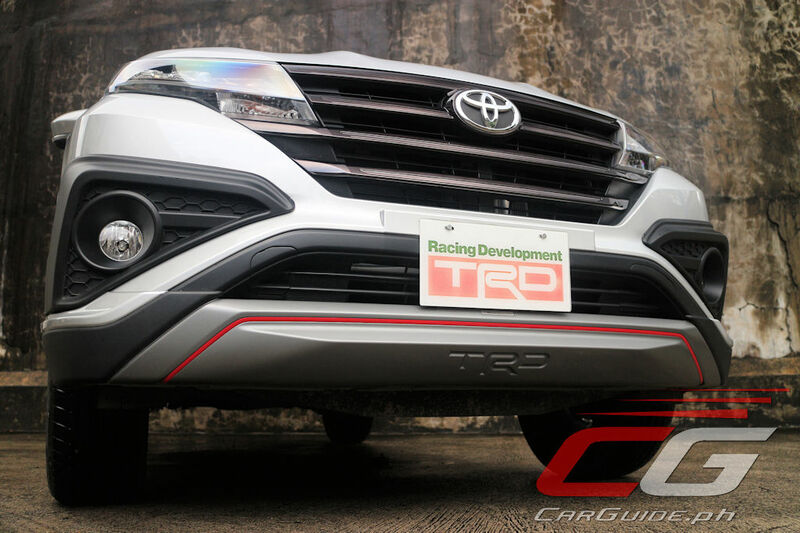 Plus, opting for the optional TRD body kit easily mends that. Exterior aesthetics aside, the only other thing going for the Rush is that it’s extremely great value for money—getting all the features that’ll make an entry-level German luxury car green with envy. 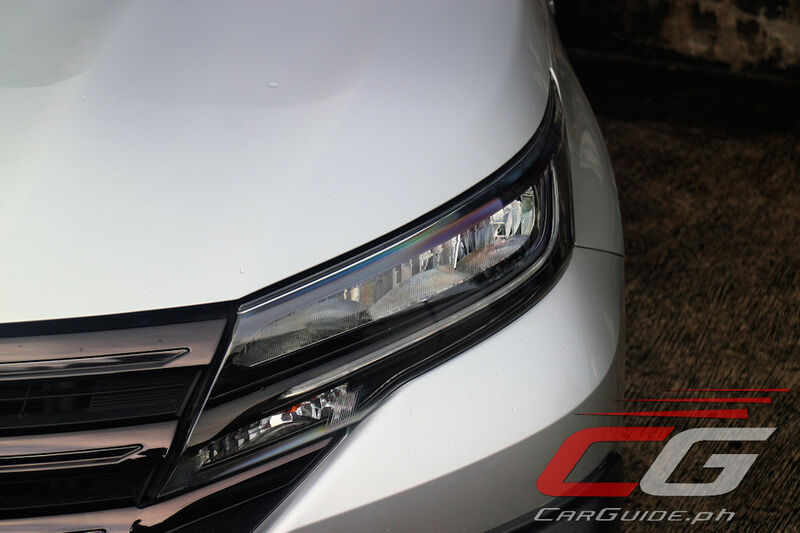 LED headlamps and taillights with automatic light control? Check. 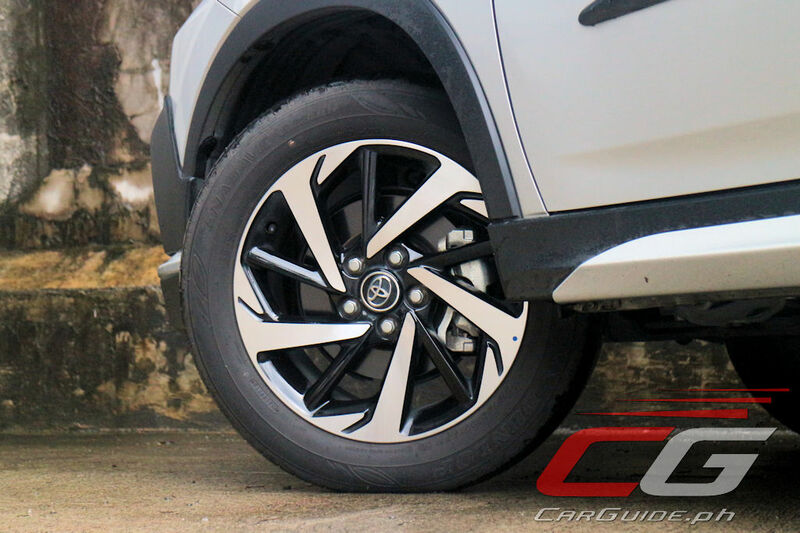 17-inch alloy wheels? Check. 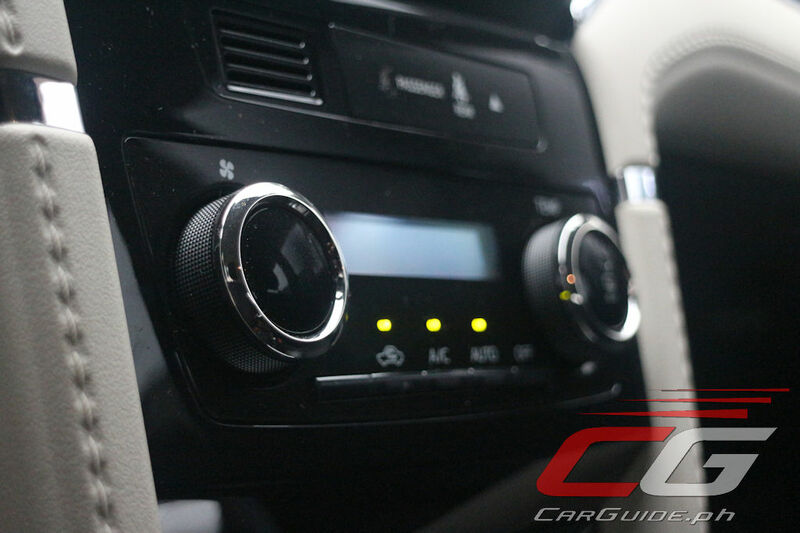 Dual-zone climate control with rear vents? Check. 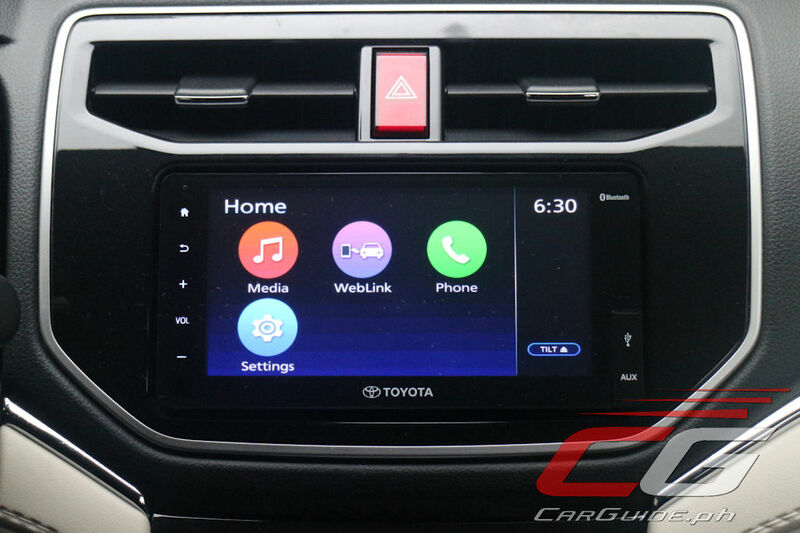 7-inch touchscreen infotainment with 8 speakers? Check. 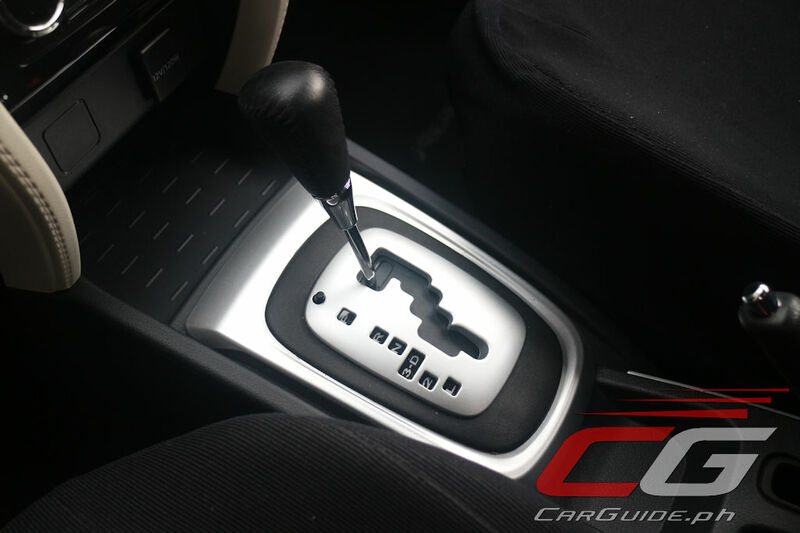 Smart keyless entry with push-button start/stop? Check. 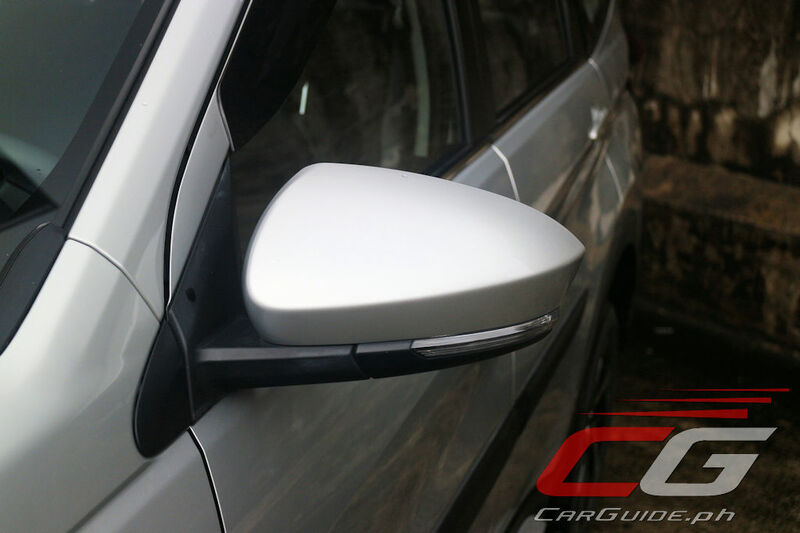 Rear parking sensors with camera? Check. 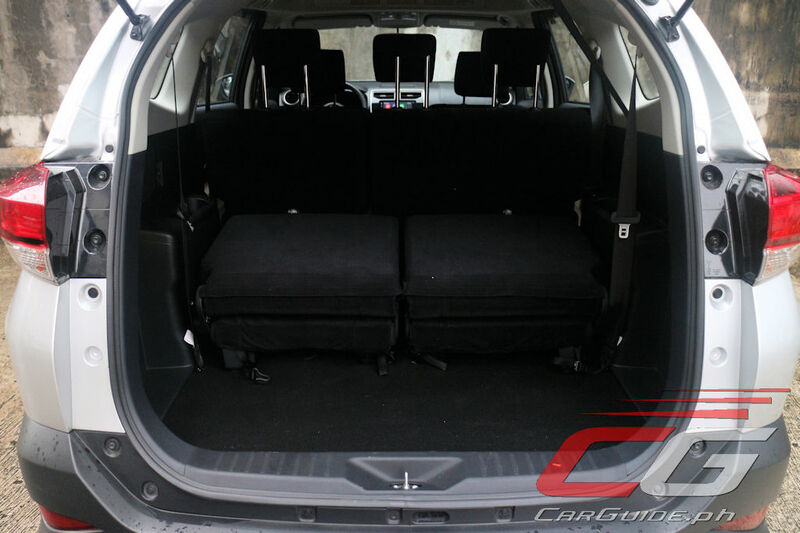 6 airbags, ABS with EBD, stability control with hill-start assist? Check, check, check, and check. And believe it or not, Toyota’s not charging an arm and a leg for all this. 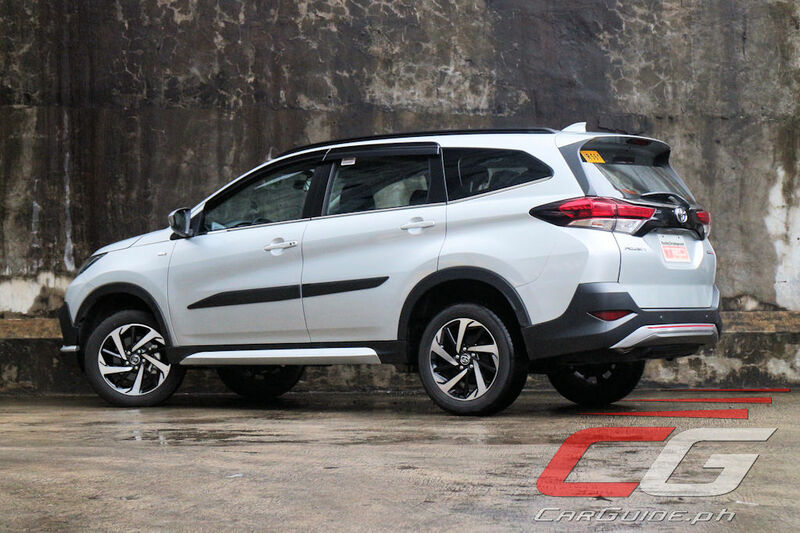 All these goodies come at just P 1,070,000, nicely undercutting its chief rivals from Honda and Mitsubishi. Now, while there’s no question that Toyota’s managed to throw everything including the kitchen sink into the Rush, it’s not without problems. Oh, and it’s got plenty. Raising the ride height while still trying to maintain that nice body proportion has one big, undesirable drawback: the lack of headroom. Call me overly critical, but don’t people buy SUVs for space? Well, unfortunately for the Rush, it’s quite lacking in the vertical aspect. Each time I try fitting my 175-cm frame (five feet, seven inches for those who think in Imperial), my head would bang against the slopping A-pillar. Going in requires a good heave and settling into the driver’s seat makes me realize how perched high I am. 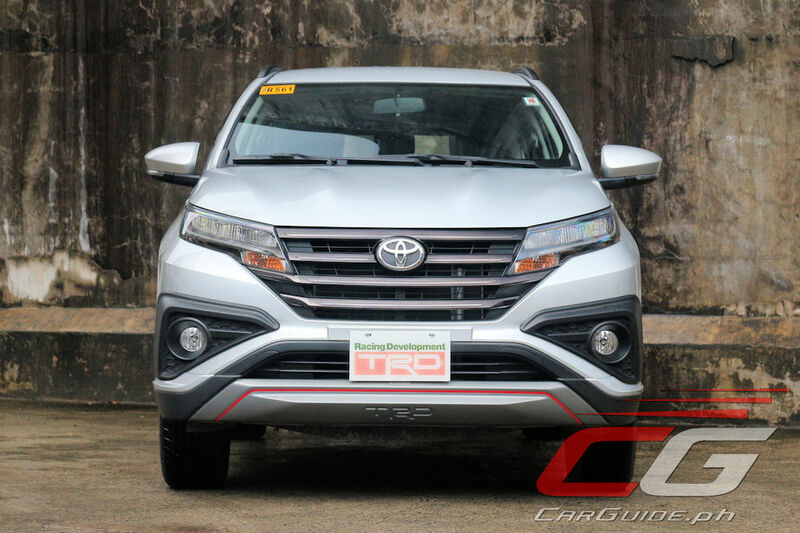 Even at its lowest setting, I find myself seeing eye-to-eye with Innova and Fortuner drivers. The remaining two rows aren’t much better, besmirched by issues as well. 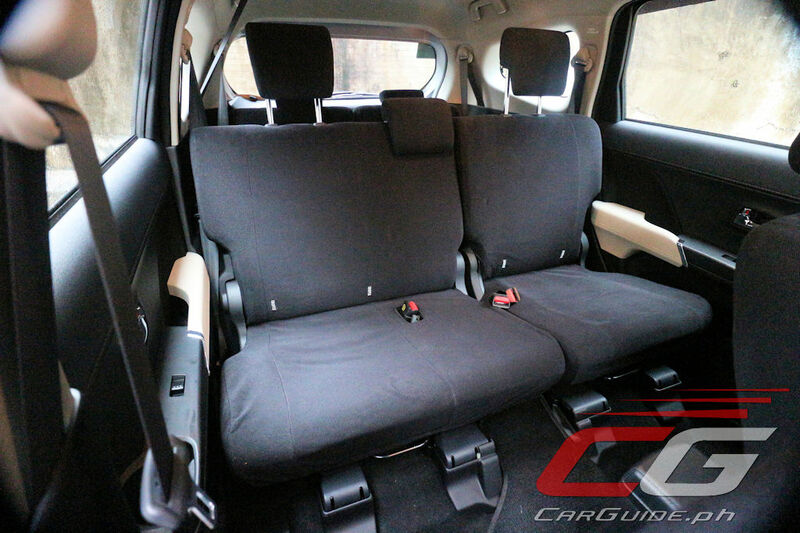 The second row’s quite usable, but the third is best left as emergency jump seats. 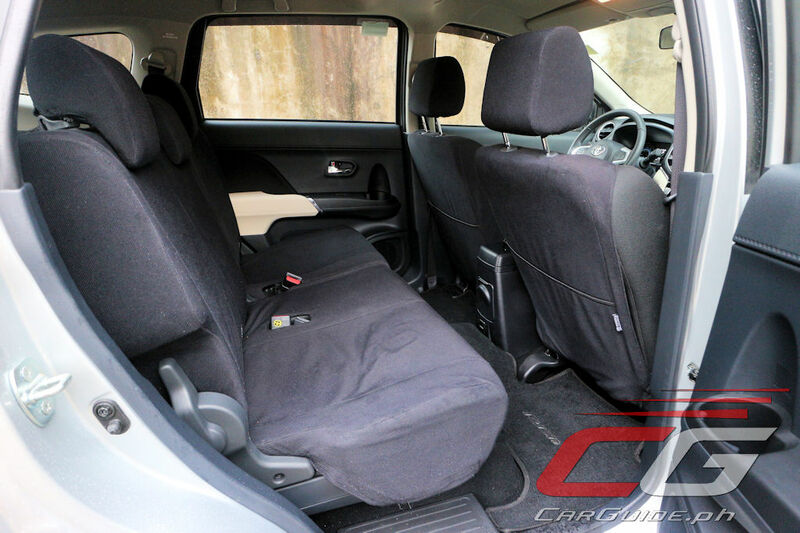 Once inside, the cabin presents itself as being tidy and easy to understand. The contrasting white patches isn’t to everyone’s tastes, but I still give kudos to Toyota for trying to inject some unique character. 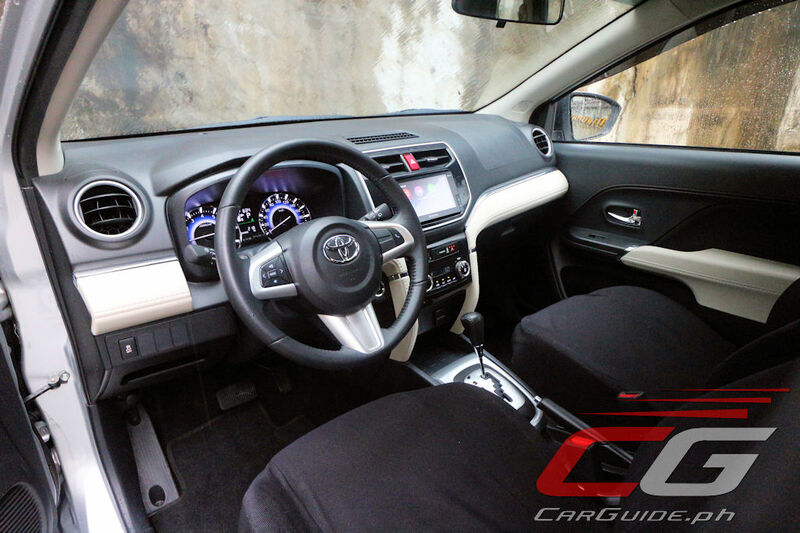 Compared to other Daihatsu-based Toyotas such as the Wigo and Avanza, the Rush’s interior fittings are certainly a step-up, though the materials are still subpar for the course. All the controls operate with a nice, tactile feel to them, although the gauges and the touchscreen infotainment screen easily wash out at the slightest hint of sunlight (and that’s even when accessing the “hidden” brightness/contrast menu). Moving to ergonomics, it’s actually quite hard to get comfortable with the Rush’s driving position. Apart from the driver’s seat that’s too high, the pedals are offset too much and the steering much too far. The end result: my body’s contorted each time I drive. This is alright for quick errands and all, but after a while it literally becomes painful drive. I swear, anyone who says that the driving position is comfortable hasn’t driven it enough. 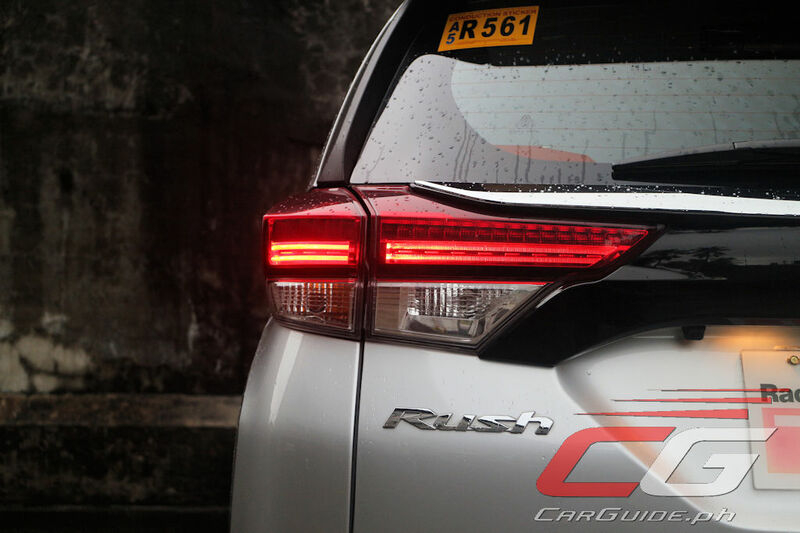 With its body-on-frame construction and rear-wheel drive, Toyota calls the Rush an authentic SUV, and they’re right. As such, I find that it can plow through perilous obstacles with ease. Even when I was presented with the C5 potholes, my favorite testing ground, it goes through them like they weren’t there. Oh, and it feels rock solid doing so. Of course, on the flipside, this suspension tuning means it rides extra, extra firm on smoother terra firma. Road corrugations are its worse enemy, rattling and jarring the entire cabin almost unfiltered. 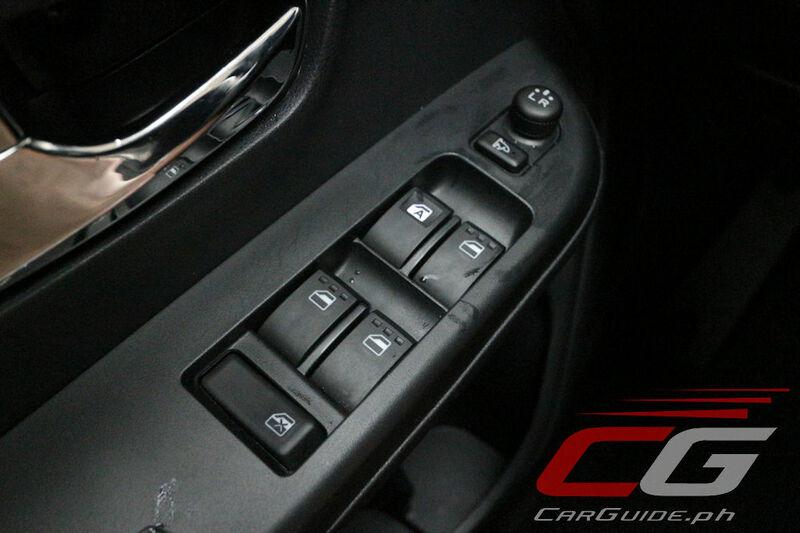 In terms of handling, it’s less than enthusiastic, preferring low- and medium-speed environments to high-speed ones. Maneuverability is never questioned since it’s very easy to squeeze it through the tightest confines of Manila (the high vantage point helps a lot). However, it takes the open road with disdain. The steering lightens, feeling almost disconnected to the front wheels; and the suspension suddenly feels less planted. I’m pretty sure it’s safe given stability control’s standard, but let’s just say that this is one of those vehicles I’m not too confident enough to push. Oh, but at least it’s mighty quiet. 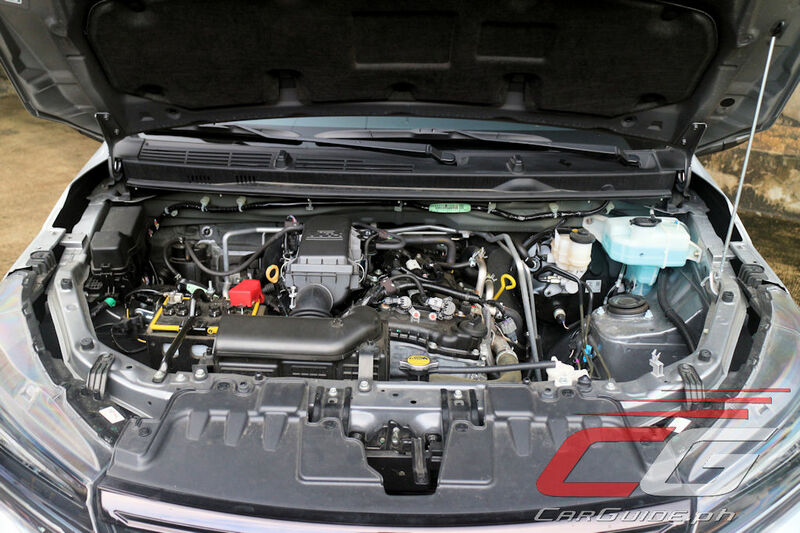 Thankfully, the drivetrain will help keep your driving in check. 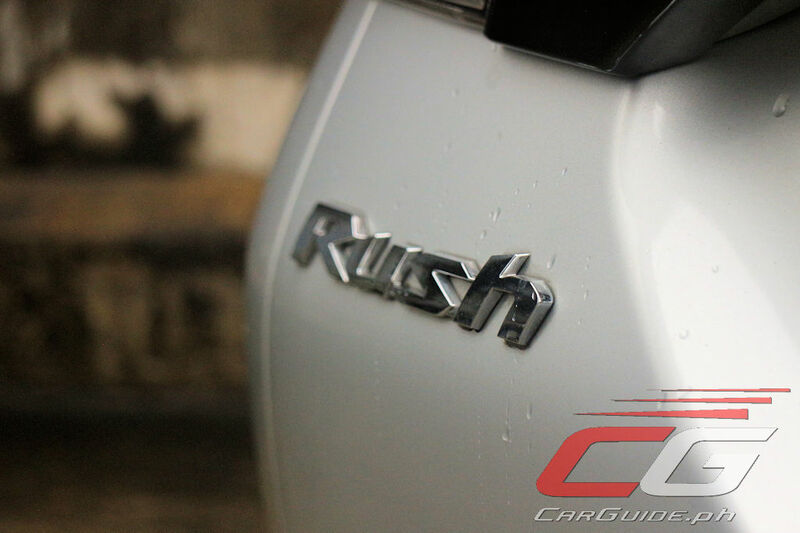 With a 1.5-liter 4-cylinder engine making 104 horsepower and 136 Nm of torque, naming this car “Rush” is an oxymoron. It takes every ounce of power to take it to highway speeds; it’s possible, but it’s glacial. As Filipinos would like to say, “walang (no) forever.” Drive the Rush and I can assure you a change of mind. 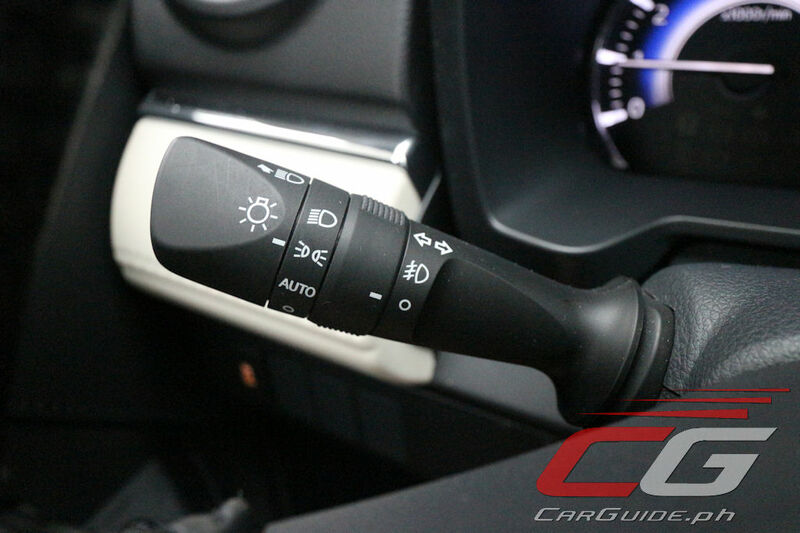 Any jab of the throttle is met with almost no surge of power. And even if I was on the floor for a couple of seconds, I was convinced that I wasn’t accelerating; only a glance of the speedometer gradually going up negates that. And mind you, this wasn’t before my ears started to protest from the boomy motor and my fat all started jiggling. With an extremely light right foot, double digital fuel economy figures are possible, but driven in the city gives back a paltry 7.3 km/L. Okay, at this point, I’m pretty sure Toyota just struck my name out of their Christmas Party list; heck, I’m not even sure I could borrow any of their vehicles ever again. But there’s nothing I can do. I say things as they are, and with that, I honestly say that I had huge expectations from the Rush. I expected it to run circles around the competition, only to have the competition run circles around it. 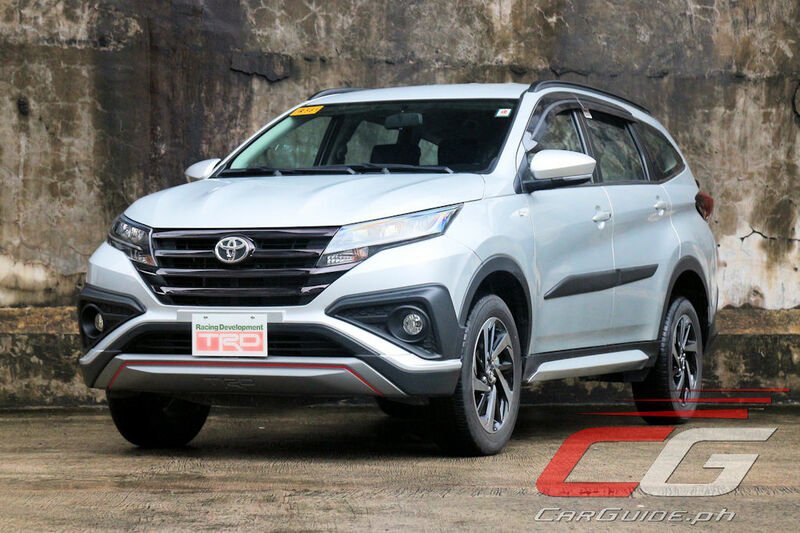 Without a doubt, Toyota will still manage to sell boatloads of their first-ever sub-compact SUV mainly because it’s got the perfect ingredients for success: looks, value-for-money, 7-seater capacity, and of course, the brand pedigree. However, once you go beyond these, it turns out, there are way better choices in this segment. "However, once you go beyond these, it turns out, there are way better choices in this segment"
Can you please provide names of the other better choices? This is not the first time I heard negatives about this car. 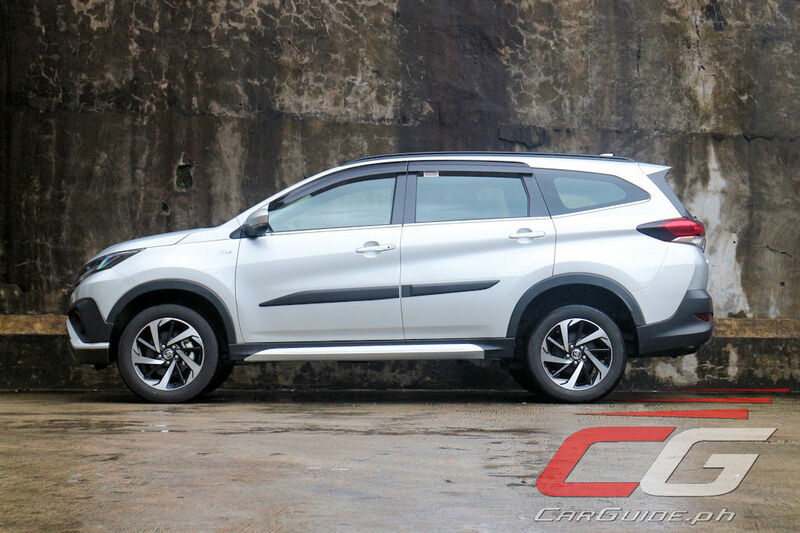 Even indonesian reviews say it lacks some NVH refinement. Did not realize it too until you pointed it out. 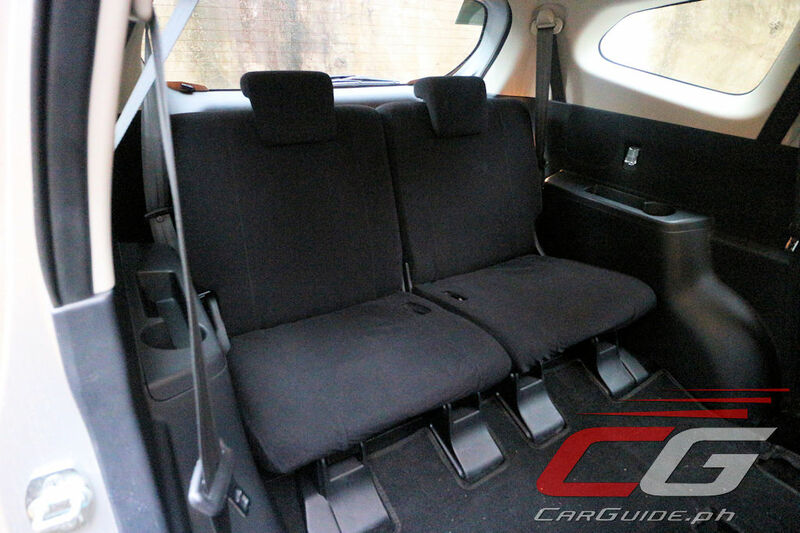 Basically a 7 seater Vios with an extra clearance and 100kg weight. If you are just hauling your kids to school this should be more than enough. people are still buying it though even if its fuel economy,ride quality and handling are bad..This is like the modern day version of the Toyota Revo. 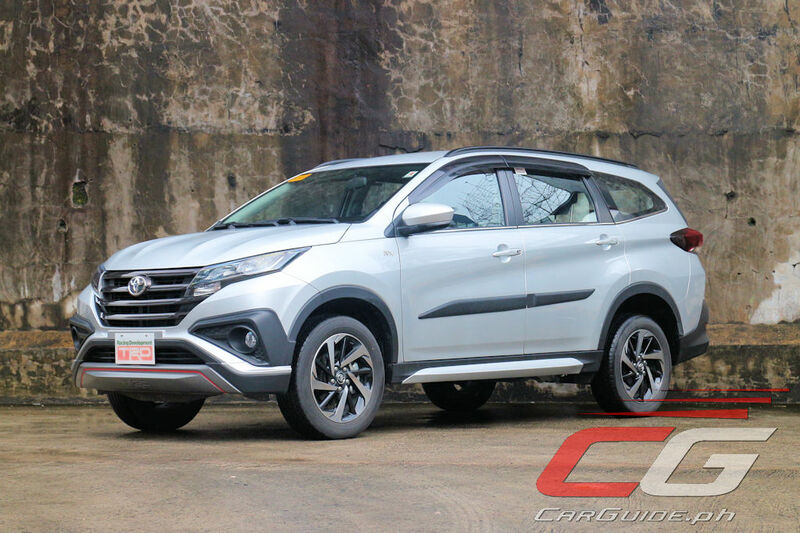 I still prefer the Toyota Rush over Honda BR-V and Haima V20..
Would rather have the BRV over this. As soon as I knew this was based off the Avanza I started expecting reviews like this. Don't wanna start any hate just my two cents. Might even want the Xpander over this. Why might? Too much chrome for me and I generally don't like it. It was just "rushed" I think. 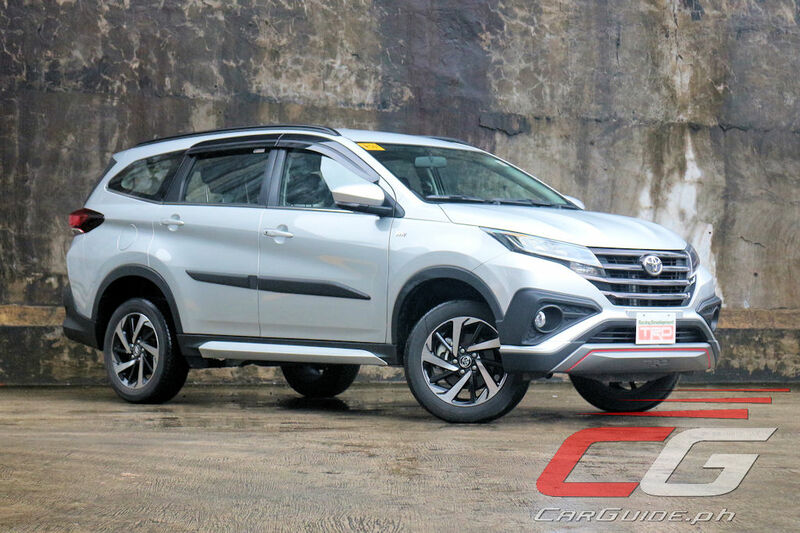 They may need a little bit more time on the drawing board but hey they saw the Xpander earlier and they feel the need to get to the market with their own sub-compact suv albeit in a rush, and given they still have the Avanza(well its an mpv). Heck it was even launch here 1st before the said competition. It was the Rush that I 1st saw on the streets of the metro given that the competition has all the hype back then. But yeah Uly is right to say Toyota has the right formula given the short comings it will still sell. Earlier though I saw this video on YT, they're chosing between this and the Xpander. They choose to check the Rush 1st, Then they went to Mitsubishi and guessed what they choose the 3 diamond brand even with a 3 to 4mos wait time. Stay away from these Daihatsu rebadge vehicles. 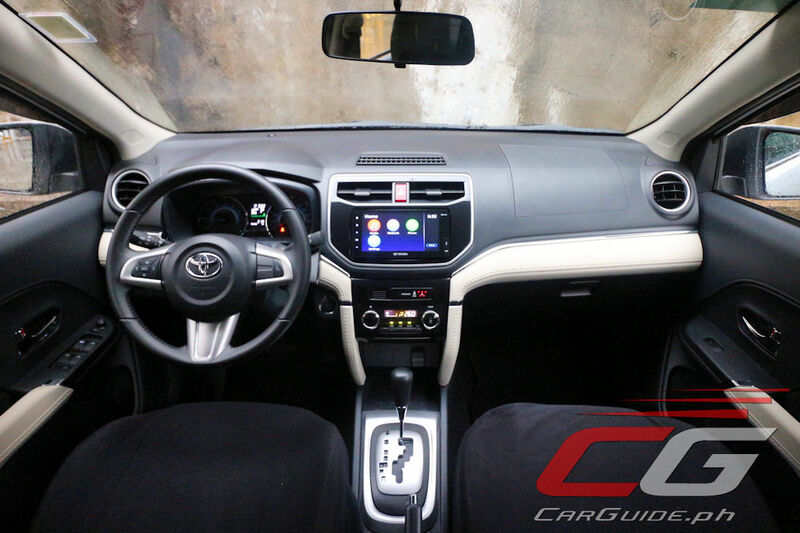 This is the only real local review of the Toyota Rush I have encountered! Daming pa iba na may mas value for money. Im not an elite, the point here is giving people informed choice. 1 million is alot for hard working average juan dela cruz. And we don't whant them to end up pretending to like something because they're stuck with the wrong choice. First of all, the looks is quite ordinary though one can argue it's suv-ish. But doesn't the old crv look like this in the front? It looks like a copy. Lots of airbags too. Every thing else is a failure in ride comfort, space, engine, etc. A wiser choice would be the Xpander. Ride height might be a bit lower than this crappy suv. But everything else is way better than this Rush. 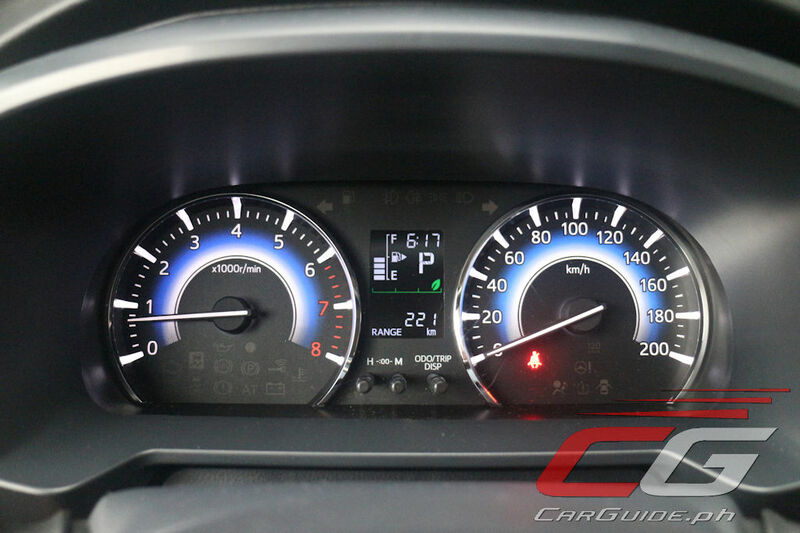 The Rush killer is the poor review on driver comfort and poor fuel economy. The other things are more bearable. Poor driving position will hurt your body and makes driving more tiring. Plus the many hours we spent on our traffic roads and its really going to kill your back. 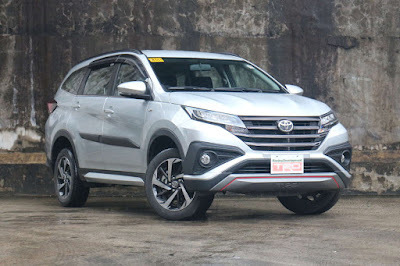 Just buy toyota rush 7 seater this month,We travel from Q.C.to tagaytay (7 person onboard) and noticed engine is humming parang maingay sya pag arangkada and also parang hirap sya umarangkada galing ng menor? Anyone experience like this? Pano nyo na resolve? Any advise? 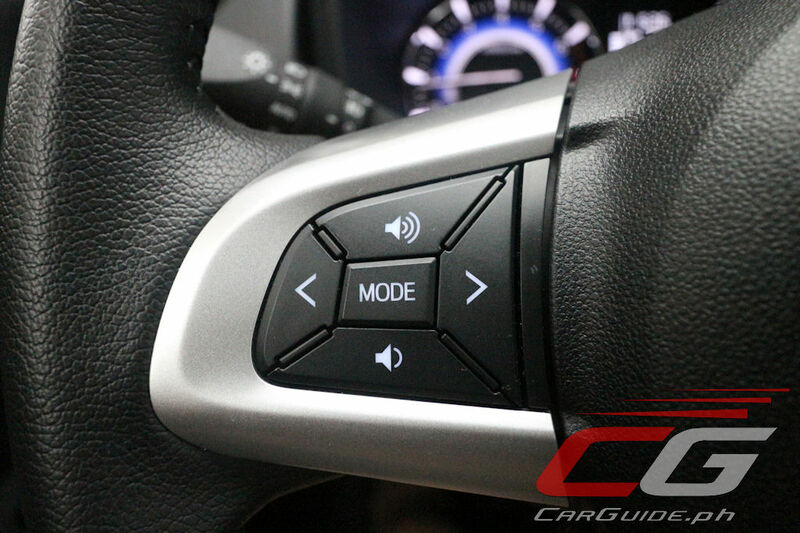 I wanted to adjust the brightness of display panel and infotainment, where can I find this '"hidden” brightness/contrast menu'?